GZA GeoEnvironmental, an environmental and geotechnical consulting firm marked its 50th anniversary by announcing a new collaboration with the New Jersey Institute of Technology (NJIT) that will provide students with scholarships and job opportunities. The partnership was announced at a celebration on the NJIT campus that included GZA engineers and scientists, the firm’s clients, NJIT professors and students, New Jersey Lt. Governor Kim Guadagno, and former Gov. Brendan Byrne. The partnership is being cited as a model of public-private sector cooperation that will advance the country’s need to produce more STEM professionals. GZA principals said the partnership would create a greater connection between GZA and one of the top universities in the state as well as help students better understand the opportunities that lie ahead for them in consulting or other technical fields. “Our business depends on our ability to encourage and attract people interested in engineering and science. NJIT has one of the best programs around,” says David Winslow, a Principal at GZA. “We see this partnership as an opportunity to help expose students to life after school, as well as to help them financially with the cost of their education. It allows us to give back to the community while also helping our firm and help our profession." “There is a lot of aging infrastructure that needs to be replaced, from bridges and tunnels to dams and roadways,” says Robert Palermo, a Senior Vice President for GZA and the lead geotechnical engineer for design for the proposed Second Avenue subway in New York City. Founded in 1964, GZA GeoEnvironmental is a multi-disciplinary firm providing environmental, geotechnical, ecological, water, and construction management services. GZA has corporate offices in Norwood, MA and over 540 employees in 27 offices in New England and the Mid-Atlantic, Great Lakes, and Appalachian Regions. For additional information, visit www.gza.com. 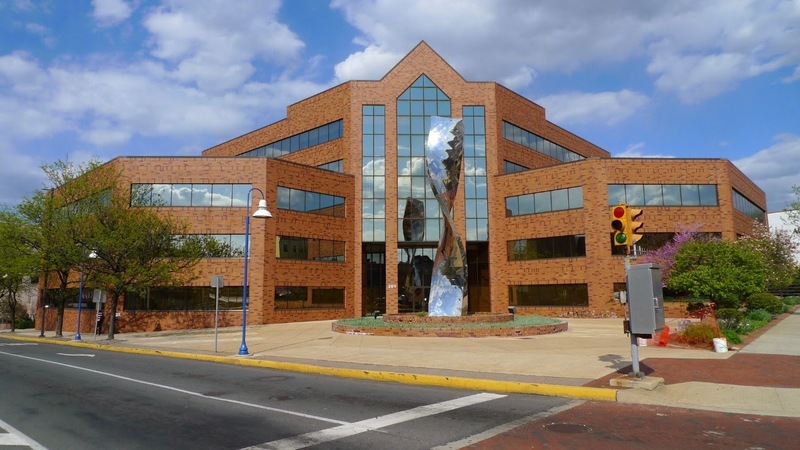 Entech Engineering has announced that they will move their corporate offices to the Gateway Building located at the corner of 2nd and Penn Streets in Reading, PA. The move to a larger office space will allow the company to continue to support its growing operations. For the past 20 years, the company’s headquarters have encompassed several floors within the American House, also located in Reading, on South Fourth Street. Entech’s full-service engineering and architectural team helps its clients make more informed decisions for their facilities and infrastructure operations. Within its 5 offices, Entech employs over 100 professionals who serve customers in the municipal, higher education, manufacturing, and natural gas markets. For more information, visit www.entecheng.com. When Jemez Pueblo leaders in northwestern New Mexico wanted to weigh the benefits of building a renewable energy project, they joined a national program that pairs tribes with Native American college student researchers. It was ideal timing for Northern Arizona University (NAU) mechanical engineering graduate student Cherise John, who used the project for her thesis, which she will present this semester. “The pueblo is looking to generate some sort of income, so part of what we did was create an economic analysis for building a large-scale photovoltaic system,” explains John, who worked on the project with students from New Mexico’s Southwestern Indian Polytechnic Institute. The research was sponsored by the American Indian Science and Engineering Society and the American Indian Higher Education Consortium and funded by the U.S. Department of Energy’s American Indian Research Education Initiative. In addition to John’s project, students at other institutions researched different real-life scenarios. The project, managed by NAU’s Institute for Tribal Professionals (ITEP) Tribal Clean Energy Resource Center, is important to the university’s strategic mission, says Mehrdad Khatibi, director of ITEP. 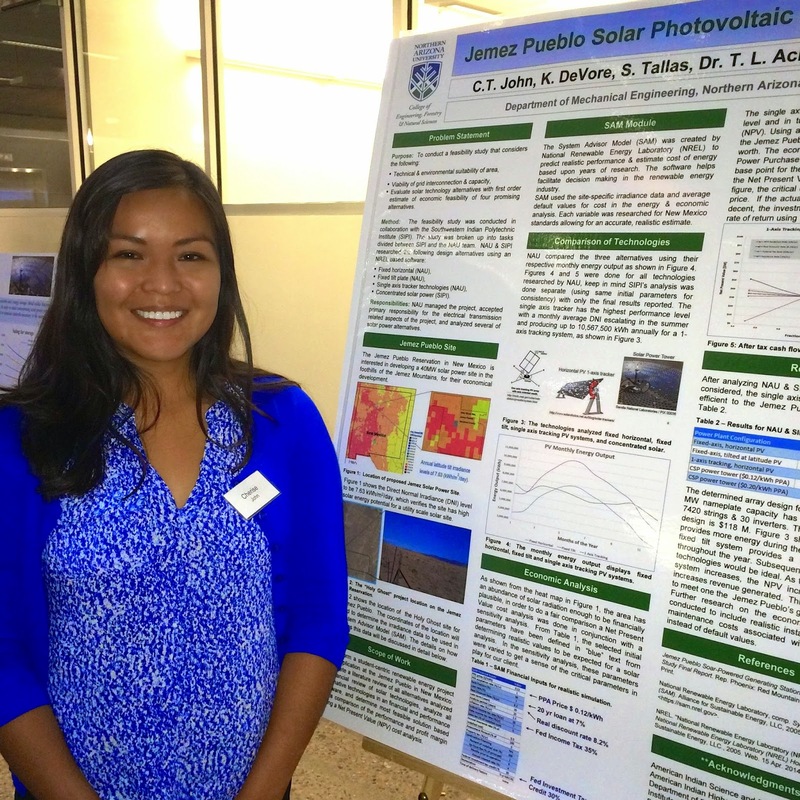 “Projects like this one give exposure to students who work on renewable energy technologies and learn what it means to work for a tribal community in the process.” Khatibi worked closely with Cherise John and her adviser, mechanical engineering professor Tom Acker. “It is important for students to work through some of the decisions tribes have to make when they are considering these renewable technologies,” Khatibi adds. John’s upbringing in New Mexico influenced her career goals of optimizing energy production and reducing byproducts. “The reason I wanted to become an engineer is because I grew up between two mine sites and two power plants. I saw the pollution and I understood the economic side of it,” says John, whose parents worked at the power plant. John recently traveled to Arizona State University to present her findings to tribal leaders and U.S. Secretary of the Department of Energy Ernest Moniz.